This was a charming 1930's house with a not-so-charming kitchen. The tight galley kitchen did not lend itself to the client's growing catering business. The only bathroom downstairs opened directly into the formal dining room. A serpentine path led through the kitchen to a utility room with laundry facilities. To fix this floor plan, we tore out the kitchen, the bathroom, the utility room, leaving the back right quarter of the house open. We combined the bathroom and the laundry room and placed them on the side wall which allowed the kitchen to be square and open rather than long and skinny. We added a picture window to bring in more light. Our main challenge lurked behind the walls and ceilings. We relocated miles of plumbing, electrical, and mechanical lines, and we furred the ceiling down with tapered shims allow for traps that we couldn't relocate and to level out a sag in the ceiling joists. The bathroom that we removed was built over a boiler pit, so the floor in that area had to be re-framed for a uniform floor level. 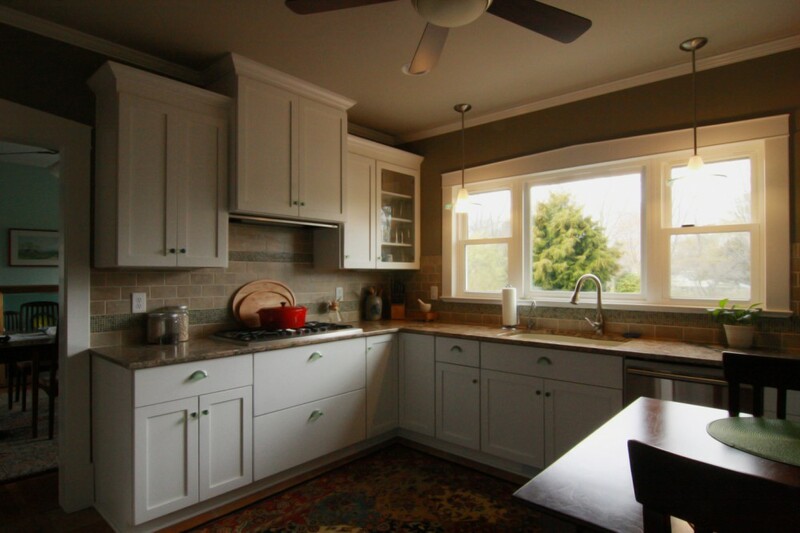 With custom cabinets, granite counter-tops, and decorative back-splash, her kitchen is now as charming as her house.